The '16 before 16' reading challenge encourages young readers to discover the books that have shaped our ideas about the world, by aiming to read at least 16 classic novels by the time they reach their 16th birthday. 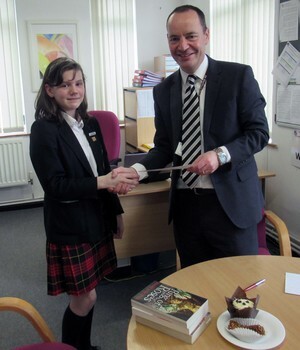 Year 7 student Angelica Peinke joined Headteacher Jeremy Garner at lunchtime to receive her certificate and prizes for completing the challenge. This is a fantastic achievement in itself, but even more incredible is that she has achieved this by age 12! Congratulations Angelica, we hope your love of reading continues!